Between the years of 1961 and 1971, in the midst of the Vietnam War, the United States military sprayed over 77 million liters of an herbicide known as Agent Orange on the country of Vietnam to destroy the tree and plant coverage in the area. 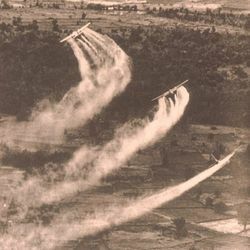 During this spraying, there were large numbers of people, including American soldiers, Vietnamese civilians, and Vietnamese soldiers fighting both sides of the war, that were also contaminated with the chemical agent, which included a very powerful, extremely toxic chemical called Dioxin. The people that were contaminated with this chemical agent suffered from Agent Orange side effects, such as different forms of cancer, as well as genetic degradation, which leads to birth defects in later generations. Prior to the Vietnam War, specifically in 1943, the compound now known as Agent Orange was created, and was based loosely on the work of scientist, Arthur Galston. His research was meant to develop a growth hormone for plants from a compound called triiodobenzoic acid. However, Galston was seriously concerned about the side effects on humans, as well as the environment. He had also discovered that over use of the compound caused irreparable defoliation. One of his colleagues, however, used this finding to create a series of herbicides. Galston later warned the American and British governments of the dangers of using this product in the manner that they planned to use it, during the Vietnam War. When processed and manufactured, the combination of the two primary chemicals used to make Agent Orange produced the chemical, Dioxin. Between two and a half million and 4.8 million people were heavily exposed to the chemical compound, which was sprayed over 12 percent of Vietnam's land area. The chemical destroyed the forest regions of Vietnam, as was planned, however, most of that was mangrove forest, which will take at least a hundred years to recover. Add to this that most indigenous species of animals from the areas that were sprayed have become extinct due to their exposure to Agent Orange, and the ecological devastation becomes even more obvious. In 1963, the United States government commissioned a study, called the Bionetics Study, which produced evidence that small amounts of Dioxin positively produced deformities of a significant level in laboratory animal offspring, as well as many other Agent Orange side effects. However, this information had been suppressed until 1969. Among the illnesses produced by some of these studies, and later attributed to Agent Orange in Vietnam War veterans were non-Hodgkin's Lymphoma, Leukemia, and Soft Tissue Sarcoma. Other serious and fatal illnesses have also been attributed to Agent Orange, as well. The chemical companies that created Agent Orange and sold it to the government, namely Dow, Diamond Shamrock, and Monsanto, were involved in a class action law suit involving the Vietnam War veterans effected and their families. The suit was settled out of court in the combined amount of approximately 108 million dollars. Once that money was distributed among the veterans involved in the suit, each veteran only received approximately 1,200 dollars. When the Vietnamese people who were affected by Agent Orange attempted a law suit, the case was dismissed by United States District Judge Jack Weinstein. The decision was appealed; however, the Second Circuit Court of Appeals upheld the ruling and added that Agent Orange, though it contained Dioxin, was not intended as a poison against humans. In their filings with the Supreme Court, the chemical companies admitted that the harm to humans was foreseeable, however it was not intended. This final statement from the chemical companies shows, without a doubt, that they knew that the Agent Orange was toxic to humans and, yet, they still provided the chemicals to the United States government. However, the responsibility for the Agent Orange side effects does not rest solely in the hands of the manufacturers. The government was also aware of the hazards that it would have on human life and chose to ignore the tests and information that they had received.